As noted in Cory's review, Kim Stanley Robinson's Aurora makes an undeniable case for ecological stewardship through a rigorous, gripping technological speculation about climate science, biology, space propulsion and sociodynamic factors. In this exclusive feature essay, Robinson explains the technology behind the best science fiction novel of 2015. Humanity traveling to the stars is an ancient dream, and a late nineteenth and early twentieth century project, proposed quickly after the first developments in rocketry. The idea spread through world culture, mainly by way of science fiction. Countless stories described people visiting planets orbiting other stars, and by a process of cultural diffusion, space travel became one part of a plausible and widely-held consensus future for humanity, a future we seemed to moving into with accelerating speed as the twentieth century progressed. With the enormous successes of Star Trek and Star Wars, the idea was firmly planted in the popular imagination: if we survived as a species, we would be moving out into the galaxy. This awesome diaspora would mark our maturity or success as a species, and would enable us to outlive the Earth itself, should it suffer a natural disaster or be destroyed by some human folly. 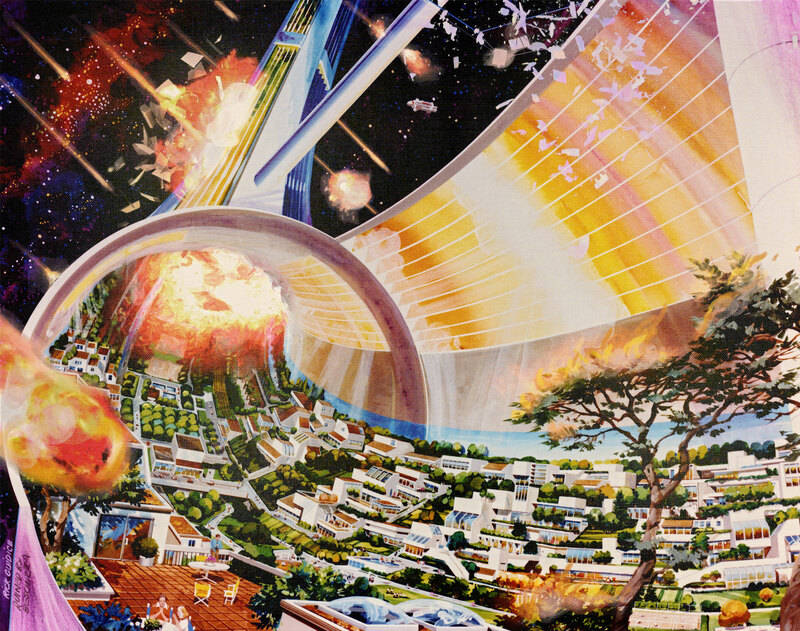 The thought of long-term galactic survival for humanity was comforting to some, and in any case it seemed inevitable, humanity’s fate or destiny. When we landed people on the moon in 1969, and robots on Mars in 1976, it seemed we were already on the way. But in the same century the idea spread, we were also learning things that made it seem less and less likely that we could do it. When the notion was first broached, we didn’t even know how big the universe was; now we do, and it’s bigger than we thought. Meanwhile, the tremendous increase in our knowledge of biology has taught us that human beings are much more complicated than we thought, being in effect complex assemblages interpenetrated with larger ecologies. These and other findings make a contemporary evaluation of the starfaring plan rather startling: one begins to see it can’t be done. Oh no! For some people this is a disturbing and deeply pessimistic conclusion to come to. Then when you combine that new judgment with the recently discovered problems concerning the plan to terraform and inhabit Mars (presence of perchlorates and absence of nitrogen), and we come to an entirely new realization about our species: there is no Planet B. This conclusion, startling to some, obvious to others, has ramifications that are worth pondering. If it comes to be a generally agreed on view, it might change how we act as individuals and a civilization. These changes in behavior might turn out to be crucial for our descendants. So although this entire discussion consists of speculations about hypothetical futures, which is to say, science fictions, still they are worth thinking about, as useful orientations in our sense of our own history as a species. The problems that will keep us from going to the stars can be loosely grouped into categories: physical, biological, ecological, sociological, and psychological. One could add economical, but economic problems are trivial compared to the rest, as economics is amenable to adjustment on demand. Reality is not so tractable. Physically, the main issue is that the stars are too far away. This problem has been finessed in many science fiction stories by the introduction of some kind of faster-than-light travel, but really this is not going to happen. It’s a convenience employed to get us out into a great story space, a magic carpet that gives us the galaxy. I like that story space very much, but any realistic plan for getting to the stars will require slower-than-light travel, probably quite a bit slower. The usual speed mentioned in these discussions, as keeping a balance between the fastest one can imagine accelerating a spaceship while still being able to decelerate it later, is one tenth of light-speed. The closest stars are four light years away, although now we know that this Centauri group has no planets we can terraform. Among other nearby stars, Tau Ceti, twelve light-years away, is now known to have planets in its habitable zone; they are too massive for human inhabitation (five or six g), but they might be orbited by habitable moons. Traveling at one-tenth light-speed, a voyage there would take 120 years plus the time needed for acceleration and deceleration, so that people speak of approximately two hundred years transit time. Thus a crossing to even the closest stars will require a multiple generation effort, and the spaceship will need to be a kind of ark, carrying all the other animals and plants the humans will carry with them to their new world. This suggests a very large and complicated machine, which would have to function in the interstellar medium for two centuries or more, with no possibility of resupply, and limited possibilities for repair. The spaceship would also have to contain within it a closed biological life support system, in which all the flows of energy and matter would have to recycle as close to perfectly as possible, minimizing catches or clogs of any kind. Here is where the biological and ecological problems come to the fore, but sticking for now to purely physical problems, the starship would be exposed to far more radiation than we are on Earth, where the atmosphere and magnetosphere protect us to an extent. Effects of that extra radiation are not fully known, but they won’t be good. Cladding would help, but would add to the weight of the ship; the fuel carried for deceleration might serve as cladding en route, but that fuel will get burned as the starship slows down, increasing the starfarers’ exposure, already higher than it would have been on Earth. Lastly, in terms of purely physical problems, if the starship runs into anything substantial (like a couple of kilograms) while moving at a tenth of light speed, the impact could be catastrophic. These physical problems, especially those concerning propulsion and deceleration, are the ones that have received the most consideration by the starship discussion and advocacy community. As engineering problems they can can be given at least hypothetical engineering solutions, using equations from physics that we know to be true. Thus they are, in effect, the easiest problems that starships will face, being relatively straightforward. But they aren’t that easy. Biological problems are harder for humans to solve than physical problems, because biology concerns life, which is extraordinarly complex, and includes emergent properties and other poorly understood behaviors. Ultimately biology is still physics, but it constitutes a more complex set of physical problems, and includes areas we can’t explain. We do know that things go wrong in biological system, because this happens all the time; living things get sick and die. They also very often eat each other, or exist as diseases for each other. These realities mean that biological and ecological problems are much more intractable than physical problems, and are unsolvable in the enclosed context of a multi-generational starship. It’s a matter of size of community, and its isolation from new inputs. A starship would be something like an island, but an island far more isolated than any island on Earth. Processes identified by island biogeography would apply inside a starship, and many of these processes would be accentuated by the radical isolation. As generations of people, plants and animals passed, reproductive and evolutionary success would be harmed by genetic bottlenecks, also disease, limits on resources, and so on. The super-islanding effect might cause more species than usual to become smaller, and to mutate in other ways, as one sees on ordinary islands. And because bacteria tend to evolve at faster rates than mammals, complete isolation may lead to the development of a suite of bacteria quite different from what the spaceship was sent off with. All mammals include huge numbers of bacteria living inside them, either symbiotically, parasitically, or without significant interaction, so this more rapid genetic shift in the bacterial community could become a big problem to all the larger creatures. On Earth there is a constant infusion of new bacteria into mammals, which sometimes can lead to bad results, as we know; but overall, it’s a necessary aspect of healthy existence. We are always teamed with many other living creatures. Eighty percent of the DNA in our bodies is not human DNA, and this relatively new discovery is startling, because it forces us to realize that we are not discrete individuals, but biomes, like little forests or swamps. Most of the creatures inside us have to be functioning well for the system as a whole to be healthy. This is a difficult balancing act, and does not work perfectly even on Earth; but divorced from Earth’s bacterial load, and thus never able to get infusions of new bacteria, the chances of suffering various immune problems similar to those observed in over-sterile Terran environments will rise markedly. This leads us to the ecological problems, or perhaps we were there all along, because biology is always ecological, as every living thing is a miniature ecological system. But focusing on the level of the community brings up the problems created by the metabolic flow of substances in a closed biological life support system. These flows, of both living and non-living substances, would have to stay balanced within fairly tight parameters, and they would have to avoid any major rifts or blockages. Cycles of oxygen and carbon dioxide, nitrogen, phosphorus, and many other chemicals and elements, would have to occur without major fluxes and without catch-points along the way where the element is getting clogged in the system. Earth experiences large ecological fluxes over time, with build-ups of certain elements (oxygen in the atmosphere, carbon in sedimentary rocks) that force evolutionary processes: whatever is alive has to adapt to the new conditions or go extinct. Both often happen. These fluxes and build-ups would happen inside a starship too, but as the starfarers would be interested in keeping themselves from going extinct, they would have to manage or finesse all the flows to keep from being harmed by them. This would require supporting almost every other living component of the system, except the diseases they would inevitably carry with them; and if chemicals like phosphorus were bonding to substrates as they cycled in the water cycle, which is something they tend to do, this would be bad for the system as a whole. There would never be a chance for exterior additions to the system, nor any good way to stop the cycles, clean up the substrates and release clogged chemicals. Nor would it be easy to fight or escape diseases that would have piggybacked their way onot the ship; or to deal with any newly evolved aggressive microbial species suddenly feeding on plants, animals, or humans. But if they do manage that, their problems would have just begun. Before discussing the problems caused by arrival at the destination, we should finishing sketching the problems during the voyage that could be called sociological and psychological. Here things necessarily get more speculative, but for sure it can be said that the people inside the starship will constitute a small and isolated community compared to the population of Earth. And they will be trapped inside their spaceship, and will have to keep the spaceship functioning in order to survive. So whatever their political organization, whether it be military or anarchic, hierarchical or democratic, the situation itself can be called totalitarian. By this I mean that their situation will demand certain behaviors to ensure their survival. They will have to tightly control their population; both maximum and minimum human numbers will be necessary, and whatever system they devise to achieve this stability, it will not include individual unconstrained choice. Also, there will be quite a few jobs that will simply have to be filled in order for their life support systems to be maintained. Again, however they manage this issue, people will not be free to do what they want, or to do nothing. So in these areas of reproduction and work, generally regarded as basic to human meaning and political freedom, the society in the starship will have to rigidly control themselves. No matter their methods for achieving this control, they will end up living in some version of a totalitarian state. The spaceship will be their state, and to keep the spaceship functioning, the state will rule. The psychological effects of all these constraints and problems, including the knowledge that Earth exists light years away, with a population millions of times bigger than the ship’s, and a land surface a trillion times larger, cannot be known for sure. It might very well feel like exile; it might feel like being born and living one’s entire life in prison. Add to this inescapable isolation and confinement the effects of an entire life spent indoors, and it seems likely there would be some bad psychological effects. Indeed it seems like a recipe for psychological disaster, a veritable witch’s brew of alienation and resentment. If anyone were to lose their sanity in this situation and decide to escape from it, it might be possible to sabotage the starship itself, destroying it and thus killing everyone aboard. Guarding against such a violent act would be necessary, thus adding to the totalitarian nature of the state, also to its stress and pressure. There would be not just alienation, isolation, and resentment, but also fear. Of course people are adaptable, and humans tend to take their surrounding for granted. As starship life would be all they had ever known, the starfarers might indeed adapt to their situation. But they would know what that situation was, and know the situation on Earth. They would know that their fate was created for them by ancestors who made the choice to enter the starship, a choice they could never unmake. That might be irritating. But say all these problems get solved somehow. Say the starship reaches its target star system, and goes into orbit around the planet the starfarers hope to inhabit. What happens then? The planet or moon they hope to inhabit will be either alive or dead. It will either harbor indigenous life, or it won’t. Both possibilities represent terrible problems for the settlers. There is a third possibility, of course, which is that they won’t be able to tell if the planet or moon is alive or not, just as we can’t tell now whether Mars is alive or dead. In that case they would still have a problem, they just wouldn’t know what kind of problem they had. Finding out could be hard. If the planet harbors indigenous life, then how that life would interact with Terran life would be impossible to determine without experiment. It might turn out to be no problem, or a small problem, or a fatal problem, but for sure it would have to be investigated before the settlement could safely proceed. If the indigenous life proved to interact badly with Terran life, this would have to be dealt with, if possible. But dealing with it might not be possible. And at what point would people decide that it was safe to come in contact with an alien life form, much less coexist with it over the long haul? That would be a hard call to make. If the planet turned out to be a dead rock, that would remove the problem of coexisting with an alien, but the planet would then have to be terraformed to make it habitable for Terran life, including humans. This would take many years, possibly centuries, possibly even thousands of years, depending on conditions and resources. Recall that the settlers will only have their single starship to power the effort, and planets or moons with gravity anywhere near Earth’s gravity will be large. Terraforming any such body will definitely require a huge application of energy, and thus take a long time. And for most if not all of that time, the settlers will either have to wait in orbit in their starship, where all the starship’s problems will still obtain, or they will live in shelters constructed on the surface of the planet, shelters that would be a grounded equivalent of the starship, still harboring most of the problems of a closed biological life support system. Either way, in space or on the new planet, they would still be experiencing most of the problems that the starship gave them during the voyage. Having survived a couple hundred years, could they continue that success much longer? Hard to say; but for sure, arrival at the destination does not end their problems. There have been many science fiction stories about starships published, and some have suggested various solutions to the problems outlined above. One is to send small ships filled with frozen embryos, which would be automatically thawed and birthed on arrival. But this solution ignores the issue of the microbiomes existing inside us; these too would have to be brought along, and even with suites of intestinal bacteria perfectly preserved, calibrated, and introduced into the newborns, there then remains the problem of educating and socializing the new youngsters. Often, if the problem is mentioned at all, the idea seems to be that robots and films and libraries could do the job. Good luck with that! Another suggestion involves what is often called hibernation, or sometimes cold sleep, or cryonic suspension. In this scenario, an adult population is put into some state of suspended animation, then awakened or reanimated when the ship reaches its destination. This seems promising at first, and indeed I used the idea myself as an emergency rescue method in my starship novel Aurora, so I’m familiar with the suggestion. But if this solution is not to become yet another version of the magic carpet, then it has to be remembered that these suspended passengers would not be completely frozen and inert, for then they would be dead. They are hibernating only; chilled and/or chemically slowed down, but not completely stopped; because we don’t know how to restart humans who have completely stopped. The passengers would therefore be living some minimally-active form of life. They would still be alive. That being the case, they would be aging. Physical problems that they had before being suspended would continue to etoliate; new physical problems might crop up, and proceed slowly along their course. This is what aging means, and slow or fast, it would happen in any living system. It’s simply entropy again, rearing its head as it always does. Because of this unavoidable process, even if we had a very successful method for slowing ourselves down, it would still not stop the passengers from aging and then dying, and that would set a limit on how far they could get. And the distances to the stars are so great that even if the bubble of the area that we could reach were expanded by a hundred times over what a normally living population might reach, that would still represent a small portion of the galaxy. A thousand light-year trip, taking over ten thousand years, would still only get us out to a bubble representing one percent of the Milky Way. That would include a lot of stars, but how many have just the right planet to fit our needs? And how would we know which ones those might be, in advance of a close examination of them? We would never know where to try to go in the first place, and wouldn’t have the luxury of stopping to look around along the way. So it won’t work. But people want to believe in it. And it has to be admitted that all the problems combined together, still don’t add up to the sheer impossibility of faster-than-light travel. Multi-generational starship travel is simply very, very, very unlikely to succeed. If the odds are something like a million to one, should we try it? Should we stop telling the story? Maybe not. One of the best novels in the history of world literature, Gene Wolfe’s Book of the Long Sun and Book of the Short Sun, a seven-volume saga telling the story of a starship voyage and the inhabitation of a new planetary system, finesses all these problems in ways that allow huge enjoyment of the story it tells. The novel justifies the entertaining of the idea, no doubt about it. But when we consider how we should behave now, we should keep in mind that the idea that if we wreck Earth we will have somewhere else to go, is simply false. That needs to be kept in mind, to set a proper value on our one and only planet, so that a moral hazard is not created that allows us to get sloppy with our caretaking of it. There is no Planet B! Earth is our only possible home! But wait: why is that so bad? I’m not saying we shouldn’t go into space; we should. We should send people to the moon, and Mars, and the asteroids, and every place we can in the solar system, putting up stations and swapping humans in and out of them. This is not only a beautiful thing to do, but useful in helping us to design a long-term relationship with Earth itself. Space science is an Earth science. The solar system is our neighborhood. But the stars are too far away. Hibernating passengers are sent on a small fast starship to a likely-looking nearby planet, with a load of frozen embryos. Most of the hibernating passengers die en route, but some survive, aging and getting weaker, but alive when the destination is reached. These ancients proceed to thaw, birth, and raise a cohert of embryos, successfully getting them to the stage of babies and toddlers. But now the hibernators, fully awake and alive, and thus aging at the usual rate, begin to die off. It’s a race to get the youngsters raised and educated while there are still any elders alive to do the job. Eventually nine decrepit post-hibernation survivors find themselves caring for seventy-six five year-olds. Interesting times! This is the heart of the novel. The planet they landed on luckily seems dead, and has ice on its surface, and even a breathable atmosphere (not likely but not impossible). The elders spread Terran bacteria on the surface, then release all the plants and animals they brought with them, hoping to terraform the place as quickly as possible. The planet has nearly one g, which is a good thing for all Terran creatures’ health, but means the planet is about as big as Earth. Terraforming will take a while, perhaps a few centuries. They all move into a habitat on the surface built by their robots, near a frozen sea. After a couple of decades pass, all the hibernators have died, and the youngsters, all twenty-five years old now, have this new world to inhabit. Good luck to them! Great story! It could join Joanna Russ’s We Who Are About To… as one of the truly memorable planetary romances in science fiction. Like that great novel, it would be both interesting and believable—indeed not just believable, but the only starfaring scenario one could possible believe!